Gabe Nelson is an Automotive News staff reporter in San Francisco. FOUNTAIN VALLEY, Calif. -- Usually with a car, the more you pay, the more you get. The launch of Google’s Android Auto and Apple’s CarPlay infotainment interfaces could upend that rule by giving cars from brands such as Chevrolet, Honda and Hyundai a better computer interface than most luxury cars have. 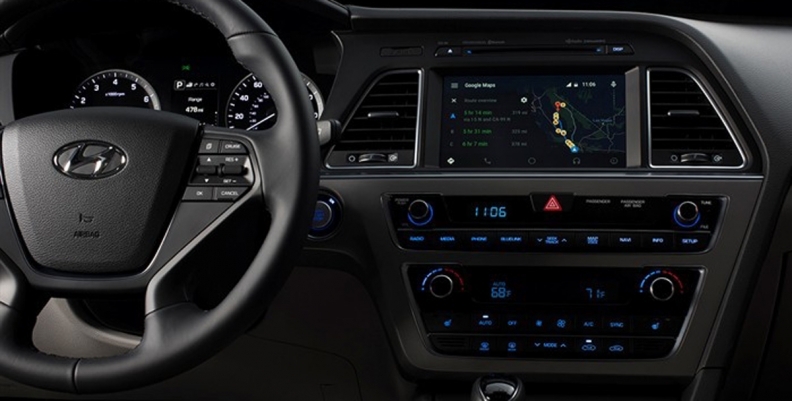 Last week I had the chance to drive a 2015 Hyundai Sonata with the production-ready version of Android Auto, which lets a driver tap into a smartphone for music, maps and phone calls. I found that the system is better for most everyday tasks -- more powerful, easier to use and less distracting -- than basically anything you’ll find in a luxury car today. Android Auto works with smartphones that use the latest version of Google’s Android operating system. To start it, you connect the phone to the USB port in the car and press the Android Auto logo on the car’s navigation screen. That pulls up a row of buttons along the bottom of the screen for music, phone calls and maps, plus a home page that shows directions to the locations of upcoming appointments and a weather report for the driver’s current location. What’s most impressive is the ability to do almost all of this with voice controls. Having driven countless vehicles in which the voice recognition is so unreliable as to be useless, I can say that Android Auto beats every in-car system I’ve used at understanding natural speech. Here’s an example: I had an upcoming flight out of John Wayne Airport in Santa Ana, Calif., so I pressed the “talk” button on the steering wheel and gave Android Auto a command: “Take me to John Wayne Airport.” It quickly pulled up a route. I pushed the button again. “I want a different route.” It gave me three options, and could be rerouted with a single press of a button. In some $80,000 luxury sedans, it would take several minutes and dozens of button presses to do the same thing. If you ask Android Auto to take you to a destination with multiple possible locations, like a supermarket, the system will give you a choice of the nearest three. You can set a reminder based on a location; the next time you approach that supermarket in your car, it will prompt you to pick up some milk. Playing music is just as simple. I gave Android Auto a tough challenge, asking for a somewhat obscure Bob Dylan tune. “Play ‘One More Cup of Coffee,’” I said, and the song played with no further prompting, piped through the Sonata’s speakers via the Google Play streaming music service. If you ask for another service, such as Spotify or traditional radio, it can do that too. After testing dozens of high-priced systems that can’t easily handle these tasks, I feel that getting such functionality in a humble Sonata is like getting a V-8 for the price of a four-cylinder, or leather seats for the price of beige cloth. Unless automakers hustle, the systems offered in luxury cars and high-end trim levels could soon feel terribly dated. These systems are a key profit center, sold in bundles that can cost $2,000 or more. Will customers pay that kind of money once they’ve gotten a taste of Apple’s and Google’s interfaces? Android Auto isn’t perfect. Because it taps into a mobile device, it won’t work as well when cellular service is spotty. Heavy use of maps and streaming music could also burn through a monthly data plan unless a driver is judicious. Automakers also must give up some control of their vehicles, which isn’t easy to accept. Hyundai has tried for years to get Americans to rhyme its name with “Sunday,” so it’s easier to pronounce. But apparently Google hasn’t gotten the memo. I pushed the voice button on the Sonata’s steering wheel and asked for directions to the nearest Hyundai dealership. That wouldn’t happen if Hyundai were calling the shots. But if Android Auto gives the company a way to one-up luxury cars with a humble family sedan, it’s a sacrifice Hyundai is surely willing to make.